I prefer not to encourage too many desserts and sweets on this site. There are so many reasons that sugar and refined sweeteners are bad for your health that I will devote an entire post to the subject in the future. That said, we do have a need to satisfy sweetness, although not as often as we think we need to. Whenever I make a dessert or sweet recipe, I aim to use far less sugar that is typically called for, or to substitute a less refined sweetener. These muffins are nothing you need to feel guilty about. 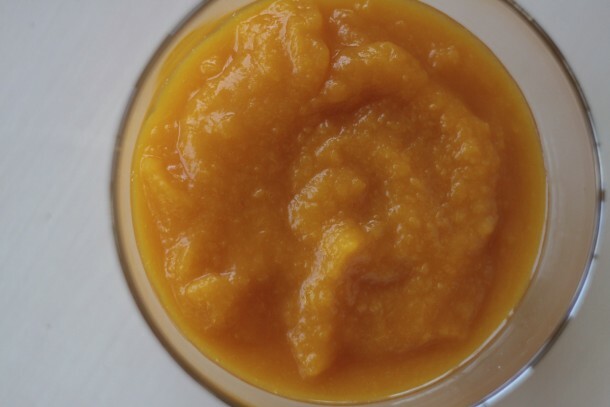 Full of nutrient-dense pumpkin, and made with whole grain flour and pure maple syrup, you’ll be making these for breakfast, lunch boxes, and soccer snacks. They freeze well and can go from freezer to lunchbox. By the time lunch rolls around, the muffin is ready to eat. People ask me all the time about making substitutions, especially making recipes gluten-free. I have made these muffins successfully with several different gluten-free mixes, including Bob’s Red Mill and King Arthur. I used Pamela’s (not me) once, but didn’t add Xanthan gum which I should have. Also, feel free to sub out something else for the currants. I did use mini-chocolate chips once for my son’s soccer team and not a one was left! Whisk all dry ingredients except nuts in a mixing bowl. 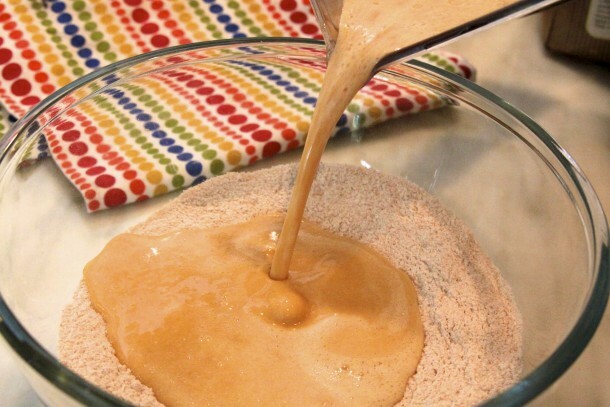 Blend all wet ingredients in a blender. Add wet to dry and mix until just combined. Do not overmix. Stir in nuts or currants. 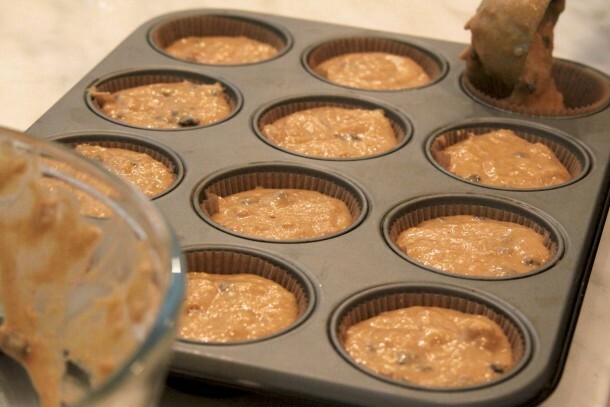 Using an ice cream scooper, scoop batter into muffin pan. Bake for 25-30 minutes or until a tester comes out clean. These were so yummy! I made them for my Nana and then I made some for a friend who is going through chemo. The spices were perfect and they were so moist. I love pumpkin so I really enjoyed them. The kids were fans too. Thank you again! Yes! Everyone is benefitting from your brilliance. Sometimes it is ok, but sometimes it’s not. If the flours all contain gluten, it’s usually ok. I find spelt to be pretty interchangeable with wheat. But it doesn’t usually work well to take a recipe with 2 cups of wheat flour and then mix a gluten-free flour and mix in it’s place. I hope that makes sense. Could I sub spelt flour for the white wholewheat? I have oat flour, AP, whole wheat and spelt but no ww pastry. Thanks! Do you think this would work as a loaf or in a bundt pan? If so, any changes to recipe, cooking temp or cooking time? Yes! It will work well in a 9 x 5-inch loaf pan for about 1 hour, give or take a few minutes depending on your oven. Do you think this would work as a loaf or in a bundt pan? If so, any changes to recipe, cooking temp or length? Time to make pumpkin muffins again! Can you please tell me what is best to use to make them gluten free? But still taste as amazing as the original recipe? Thanks so much!! Have you tried King Arthur multi-purpose GF flour and a little xanthan gum? Made these yesterday for my kids. They went crazy for them!! Even my picky eater polished his muffin off and asked for one in his lunch today! Thank you! Really?? That’s awesome! Happy kids eating good food! these are delicious! kids are asking for another one as i write….i didn’t have enough currants so added in chopped dried cranberries. Thank you! good improvisation with the cranberries! These are my kids absolute favorite! Found your website last week and love it! Made these muffins and the whole family liked them. It is nice to find a muffin recipe I don’t have to tweak in terms of flour and sweetener. The only change I made was to use allspice instead of nutmeg. Solid recipe! Plan to make it again soon. I love allspice! Good call! Since it is my goal when making breakfast muffins to use no more than 1/2 cup of sweetener per dozen muffins, I reduced the maple syrup to 1/2 cup, increasing the pumpkin by 1/4 cup to make up for the moisture difference. Still sweet enough, and we’re getting less sugar and more vegetable! Always a good thing! Thanks for the recipe. I like the way you think! Thank you so much for the suggestion. I’m going to try it myself! Just made these and they came out AMAZING! I added non dairy chocolate chips, pumpkin spice and a little bit of brown sugar on top before baking. So making these again but next time want to see how they come out when I use an egg substitute to make them vegan. Very cool, Cheryl! You won’t have trouble making these vegan either with an egg substitute or by using 1 Tbs. ground flaxseed + 3 Tbs. warm water allowed to sit 15 minutes before adding to batter. This is in place of one egg. Yum! Great muffins! Super yummy, they didn’t last long at my house. I added chia seeds to the dry mixture and they turned out great! How much chia seed did you add? Thanks! I made these yesterday and my Mr. Picky loved them — he even asked to have one in his lunch–unheard of! Although I did have to call them pumpkin pie muffins to get him to try them. Thanks for the recipe. I have a child that can not have sugar. She cannot digest it, therefore the whole family doesn’t have sugar. I would love to make pumpkin muffins using date sugar or apple juice concentrate. Can you help me? Here’s what I would suggest off the top of my head: I have successfully used a date puree with these muffins. Check out my Date-Sweetened Banana Bread recipe for the technique https://pamelasalzman.com/date-sweetened-banana-bread/ I used the date puree in place of 1/2 cup maple syrup and then I kept 1/4 cup maple syrup. But since your child can’t have maple, I would use apple juice instead of the milk. Re: date sugar, it’s pretty dry stuff and you can try subbing 3/4 cup of it for 3/4 cup of maple syrup OR my instinct tells me you could probably make a syrup out of it with a little hot water and use that. Let me know if you have any questions about that. i want to make your pumpkin muffins for my daughter’s preschool class – i’m “snack mommy” on thursday. only problem is that one of her little classmates is allergic to dairy and eggs. can i have your ideas on replacements? Stephanie, see Sharla’s comment below. I am assuming Sharla used an egg substitute like Ener G, but 1 Tablespoon of ground flaxseed soaked in 3 Tablespoons of warm water for 5 minutes is also a good substitute for 1 egg. Dairy is easy — just use almond milk or rice milk. I’m going to put these in a care package for my college freshman as a little Halloween treat he can wash down with some of that delicious Keystone beer he’s been consuming. Ha! You made me laugh! Oh dear. Yes, do send him something nutritious. Too cute. At least you can feel good about what’s in them. Try the date-sweetened banana bread for a change of pace. So good to know! Thank you, Sharla! I made these last night and accidentally used an entire can of pumpkin (instead of half). So I doubled the recipe on the fly and the muffins still turned out great. I used 70% cocoa chocolate pieces (little cubes) from Whole Foods and my kids loved them. I also used mini muffin pans and they cook WAY faster (like 12 minutes) – wanted to share the tip. Thanks for the recipe! Thanks for the great tip! Also, if you made too many, they freeze really well. Simply delicious, no one would guess there is no sugar in this recipe. I made these for a brunch and had to share the recipe with everyone. They were such a hit! I made these for my 9 and 12 year olds and I put them in the freezer and pull them out the night before and warm them. Or, I stick a frozen one in their lunch box! WE LOVE THEM! SO good! my favorite muffins I’ve ever had! Love them! I love the combination of spices and the maple syrup! 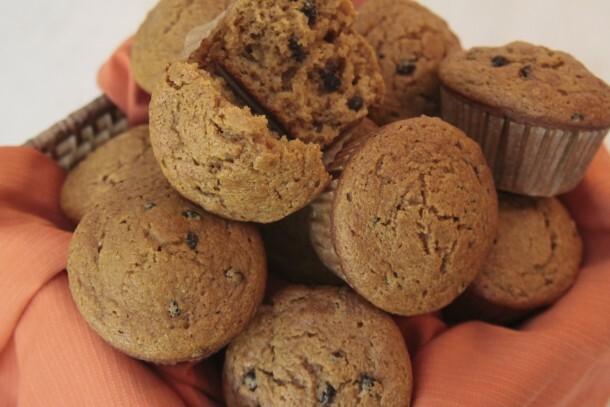 The muffins are so moist and have a great pumpkin flavor!